Choosing tile for the kitchen and bathrooms at the farmhouse has proven to be one of the easiest selections that I've made to date. For me, the wide range of materials that's out there has made the job easier rather than more difficult. Like I did last week, today I'm sharing my choices and showing you what I found at Floor & Decor. When I began designing the farmhouse, I chose to make the color palette for the floors, tile, counter tops and cabinets completely neutral. Since I tend to like redecorate about every fifteen minutes often, keeping the more permanent parts of my home neutral allows me to introduce color through paint and fabric. I know myself well enough to know that this is the best way for me to decorate. I also know that I like to use natural materials whenever possible but if the price is right and the quality is good, porcelain that looks like natural stone is a cost effective alternative for some areas of my home. 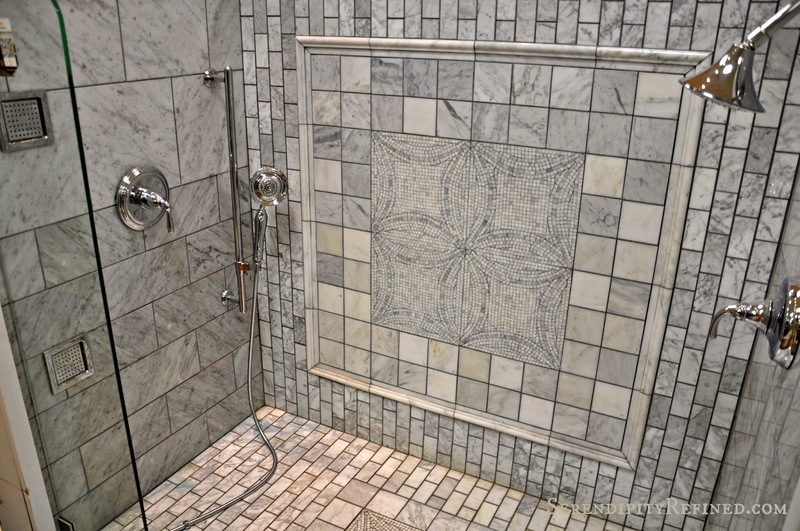 Since I'll be using hexagonal terracotta tile in the stable hall and the hall to my studio, I feel that it's a good idea to use that same hexagonal shape on the floor of the master bath or in the shower, for continuity. 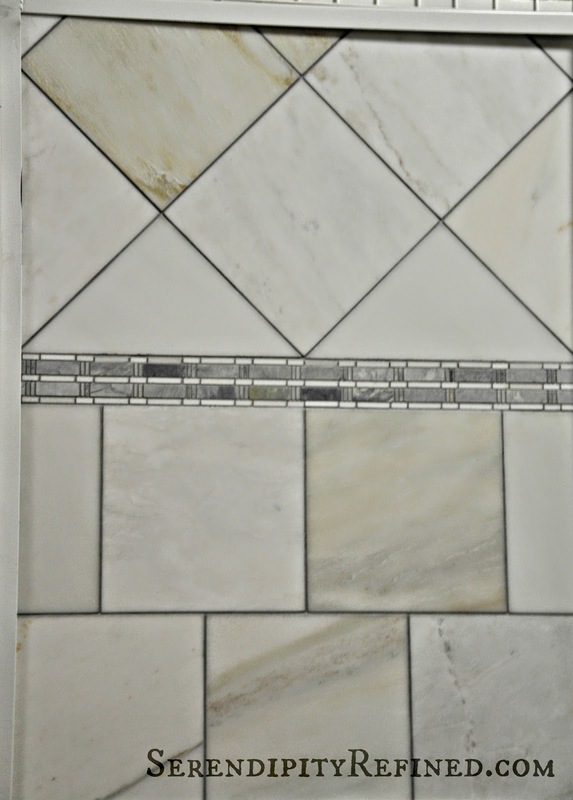 I've found that using larger tiles with just a few accent pieces saves on installation as well as tile cost. First, let's talk about my new kitchen. It will be a combination of shades of gray and white with dark wood flooring, a natural wood island and open shelves. 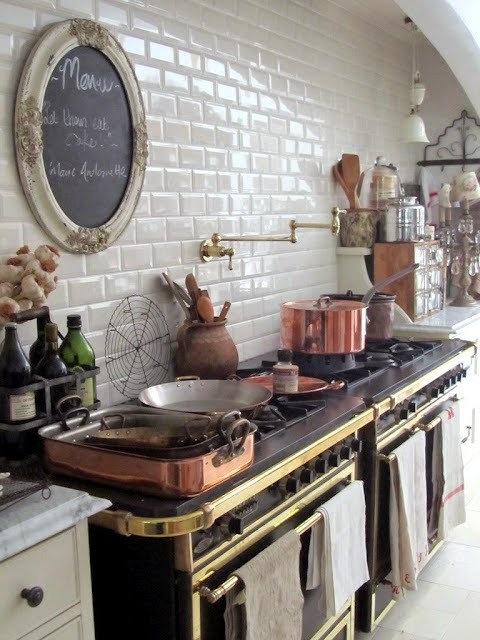 The the style of my new kitchen is French country farmhouse (with the emphasis on farmhouse, of course!) 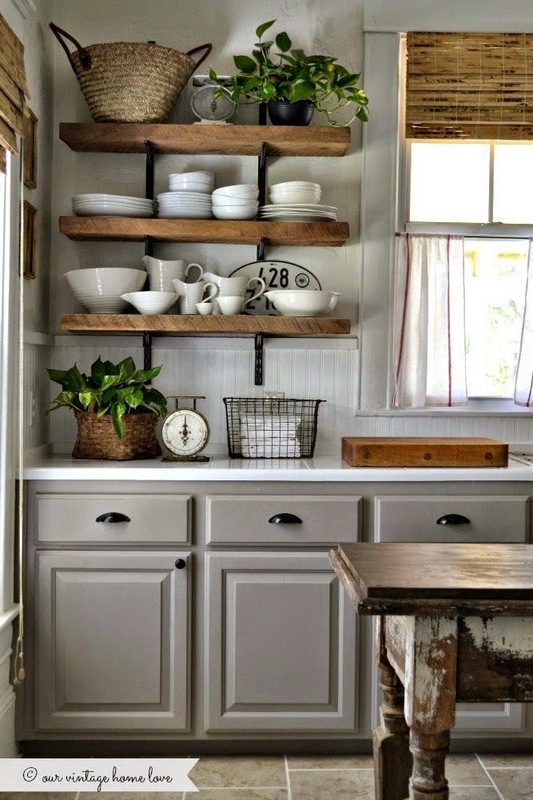 I'll be using rustic finishes like painted cabinets and honed counter tops. I'm considering poured concrete or soapstone for part of the counter tops but will have Vermont Imperial marble on the island. 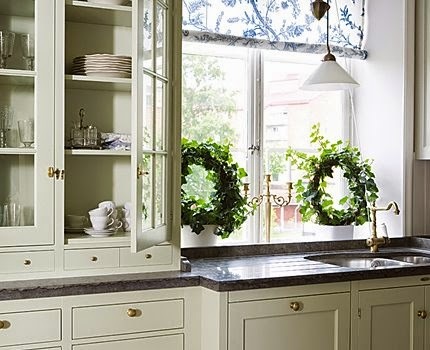 My kitchen cabinets and shelves will be similar in color and feel to the fabulous kitchen above from Our Vintage Home. 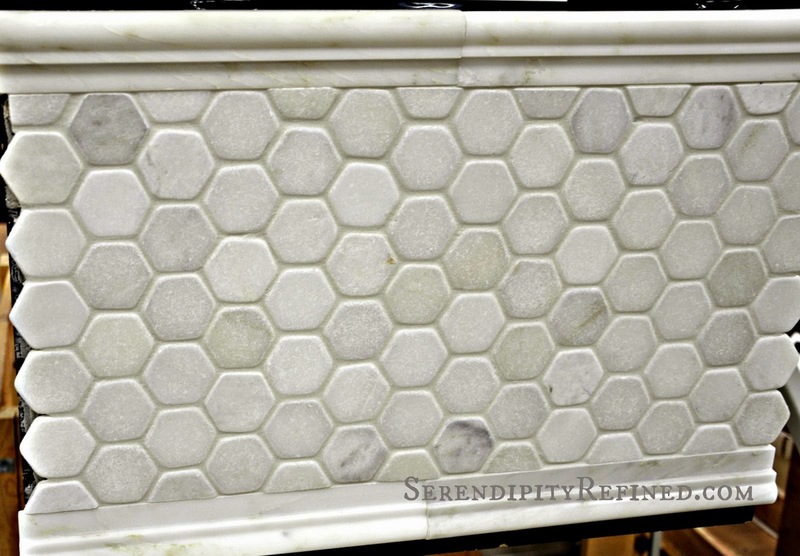 I've chosen over-sized subway tile in white for my kitchen. 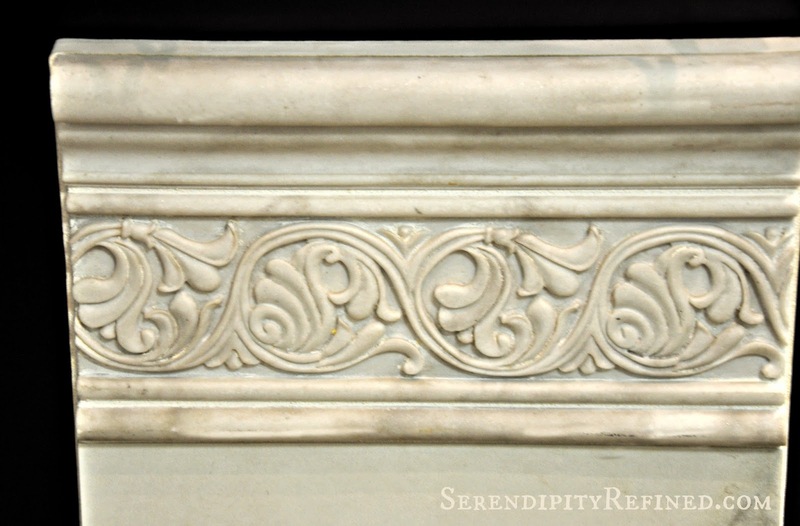 I think that it will blend well with my gray cabinets and gray and white counter tops. Installing oversized the tile will provide a updated feel and proper scale while giving me the traditional feel that I'm trying to achieve. 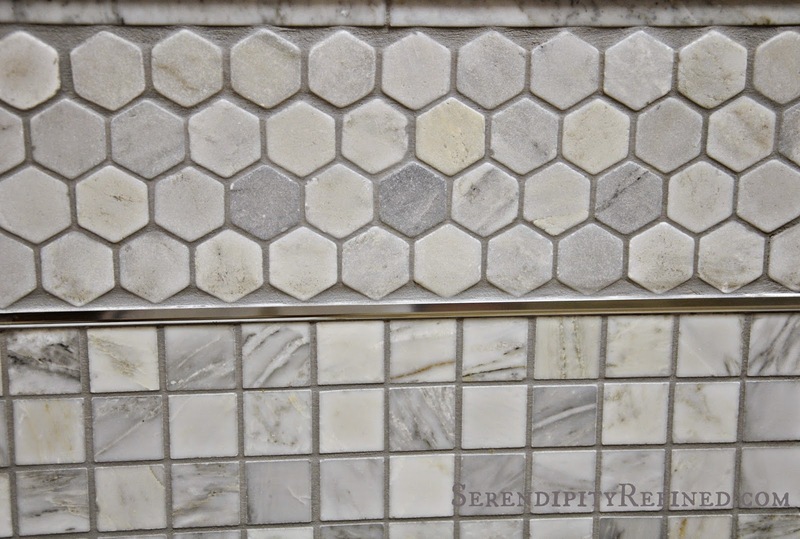 I think that the tile on the bottom of the display below would work nicely as a kitchen back splash, don't you? 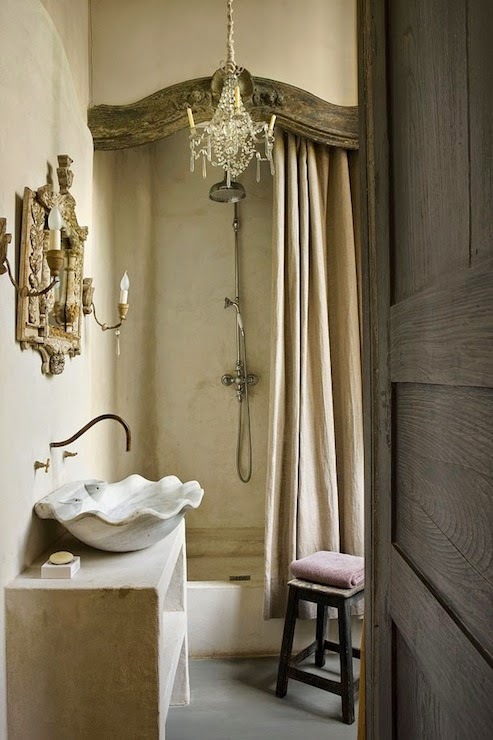 Of course, it would be pretty spectacular in the shower i the upstairs bath, too! Where was I? Oh yeah, vessel sinks. 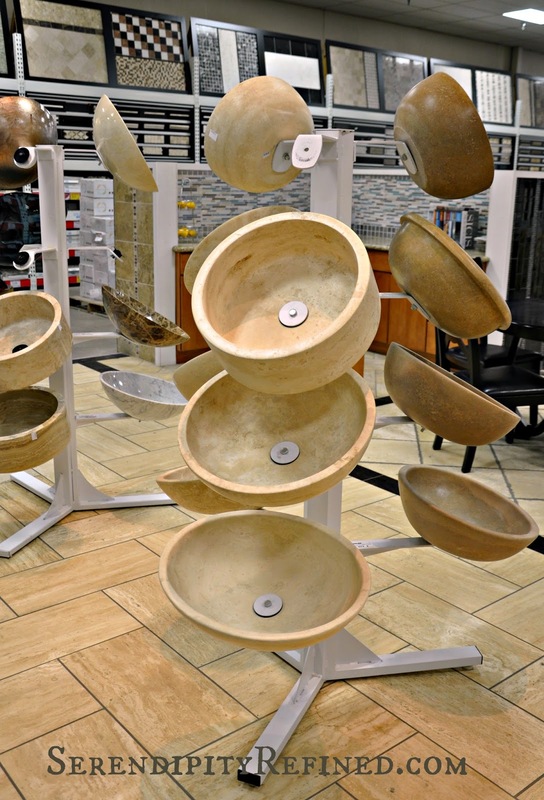 I was really pleased to find that Floor & Decor carries what I consider to be a pretty substantial selection of vessel sinks. I'm sure that I'll be find something that will be perfect. There are two full bathrooms in our home, one in the hall of the second floor and one is a master ensuite. Both will have gray and white tile, both will likely have gray cabinets, both will have white fixtures. 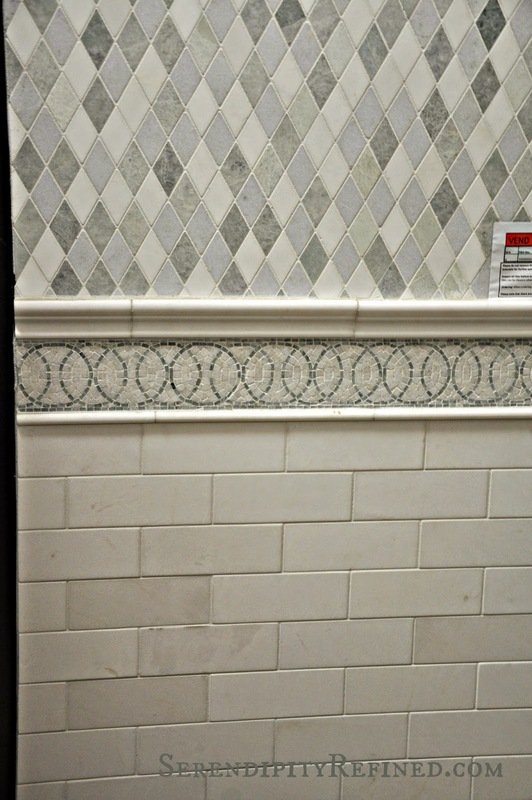 Color wise, that may seem boring, but using an interesting tile layout and things like mosaic accents or carved pieces like this one that I found will help to make them simple but beautiful. and that harlequin....maybe just a little?! However, before I do any of that, either today or tomorrow (September 12th and 13th), I'm going to the Grand opening of the new Floor & Decor at 3300 Oakton in Skokie, IL to check them out! You know that I love to shop and I want to make sure to check out all of the latest options before I purchase. If you're in the area, here's what's going on at the store this weekend. Maybe I'll see you there. Disclosure: I was compensated for writing this post. However, my account of my experience with Floor and Decor as well as my opinion of them is my own. I only write about products and services that I use personally in my own home and it is my policy and promise to you, the reader, that all reviews are genuine, 100% honest, and reflect my experience with the product or service being reviewed.